If anything you do touches retail or e-commerce, you know it isn’t enough to focus on a single sales channel anymore. 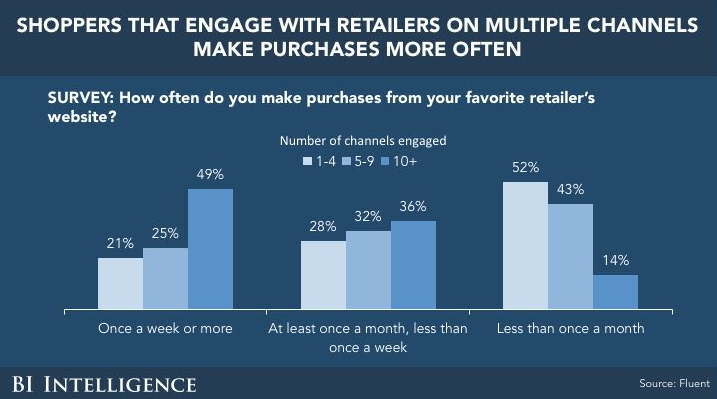 A recent Fluent survey found that 47% of shoppers who engage with retailers across 10 or more channels make purchases from their favorite retailer’s website at least once a week, compared to just 21% for those who engage across one to four channels. And social is becoming increasingly important, as Epsilon found that retailers’ social channels led 29% of US shoppers to try a new brand or product. That figure was 28% for brands’ social media and 22% for consumers’ friends’ social media. 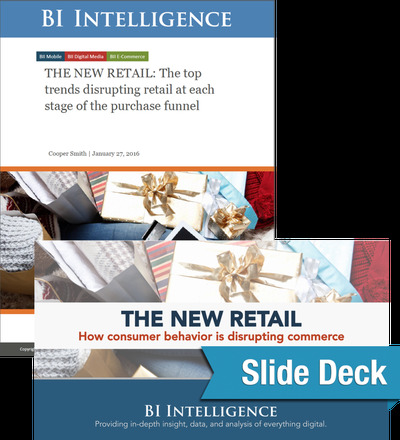 With thousands of hours of research condensed into in-depth reports, BI Intelligence, Business Insider’s premium research service, is here to help you with your omnichannel strategy and has developed an exclusive bundle of reports entitled The Omnichannel Strategy Bundle. To catch up with changing consumer behavior, physical retailers are adopting digital technologies – from beacons to interactive fitting rooms – to keep customers engaged and coming back for more. These in-store technologies are interactive, productive tools designed to catch the attention of increasingly tech-savvy consumers. In this report and slide deck we look at some of the top trends that affected retailers at each stage of the purchase funnel and how they’re responding to those shifts. Payment gateways specifically stand to benefit from the rapid growth of the online processing market, worth an estimated $ 10.7 billion this year, even though their revenue is a very small slice of the total. 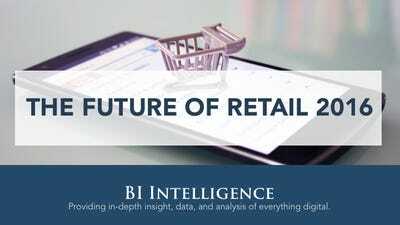 BI Intelligence estimates that the US online processing market will increase at a five-year CAGR of 13% to $ 17.5 billion by 2020, driven by the increase in online shopping volume. Gateways could moreover be disruptive to the old guard of processors. For example, Alipay has become a top-ten global merchant acquirer almost overnight because of its massive processing volume through Alibaba’s marketplaces. And the emergence of online-to-offline (O2O) and omnichannel commerce is giving gateways a chance to divert significant in-store volume away from legacy processors. The US payments ecosystem is in the midst of a shift toward mobile, and countless new and old stakeholders are attempting to accelerate this migration, which is moving at a glacial pace relative to other markets globally. But mobile payments can rise to the mainstream. For companies seeking to build out a robust mobile payments product, China’s thriving mobile payments ecosystem offers some insight — and some lessons. Total mobile payments volume in China will reach $ 6.3 trillion by 2020, according to our estimates based on iResearch data. This marks a healthy 33% five-year compound annual growth rate (CAGR). In comparison, the US will generate $ 154 billion in mobile payments volume this year by our estimates, which amounts to just 6.5% of China’s mobile payments volume. Even accounting for population discrepancies, China will generate over $ 1,700 in mobile payments volume per capita in 2016, compared with $ 475 in the US, based on forecasts from BI Intelligence and eMarketer. China’s advantage will eventually diminish, but it will still produce around twice as much volume per capita in 2020. China has unique factors buoying the industry, like the dominance of mobile phones, a lack of legacy infrastructure, and the surging popularity of digital retail marketplaces. Some of the characteristics behind the country’s success can be mimicked, or even replicated to some extent, in other markets like the US. However, one fundamental barrier in the US is that it’s being forced to layer mobile payments on top of an existing payments system, and the ecosystem is very fragmented. 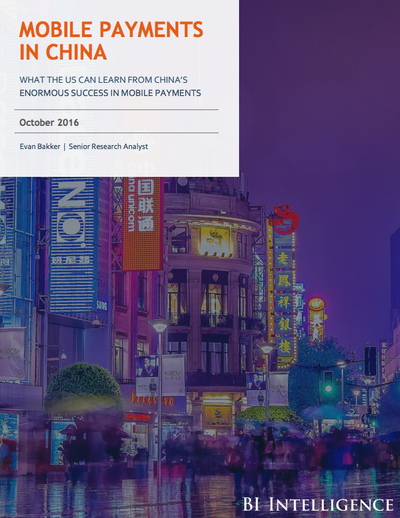 This report takes a deep dive into China’s mobile payments ecosystem and deciphers which growth drivers can be exported to the US to help spark its relatively lackluster market. As the devices begin to go mainstream, brands and retailers in the consumer packaged goods (CPG) market stand to see the biggest lift from beacon programs. That’s because CPG products are typically inexpensive items that are purchased frequently. This allows beacons to gather lots of data on shopping habits and use that data to send personalized, location-based messages. Lots of consumers click on an item they’re interested in online, transfer it to their shopping cart, but in the next moment, get cold feet and close the tab, a common consumer behavior called shopping cart abandonment. It’s a growing problem for e-commerce merchants, who we estimate will lose $ 4.6 trillion worth of merchandise to abandoned carts in 2016, up from $ 4.2 trillion in 2013. Why are merchants losing even more now? 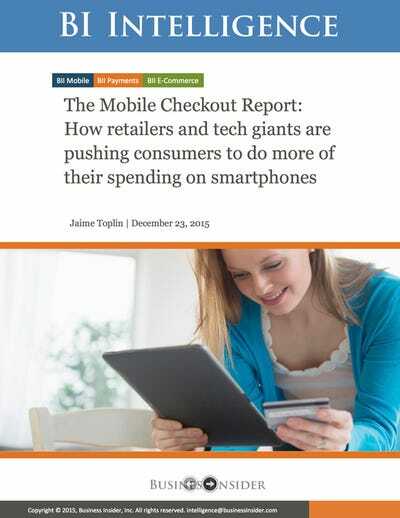 Mobile is exacerbating the issue as it rises in prominence as a browsing and purchasing device, because it’s easy to search for items on mobile, but entering all of the form fields at the checkout stage is still difficult. Mobile phones represented 46% of global e-commerce traffic in Q2 2016 but just 27% of purchases, according to Criteo, indicating that conversion rates are still low on mobile. Luckily, a huge chunk of the sales within abandoned shopping carts is recoverable. We estimate $ 2.75 trillion of abandoned merchandise is recoverable, presenting merchants with a huge opportunity to capture additional sales. To recoup these sales, merchants in part need to examine email retargeting strategies, app development, and the prioritization of establishing repeat customers. Merchants that effectively manage their abandoned shopping carts can bolster sales growth and gain a competitive edge in the e-commerce market. 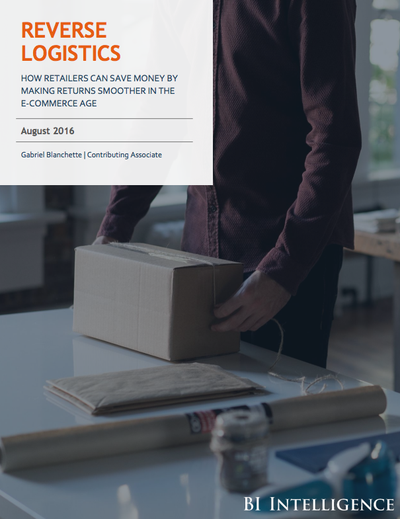 In this report we break down the growth factors behind click and collect in the UK. We discuss the retailers successfully implementing the fulfillment method, examine the of impact consumer behavior, and outline some key steps that US retailers can take to replicate the UK’s performance. 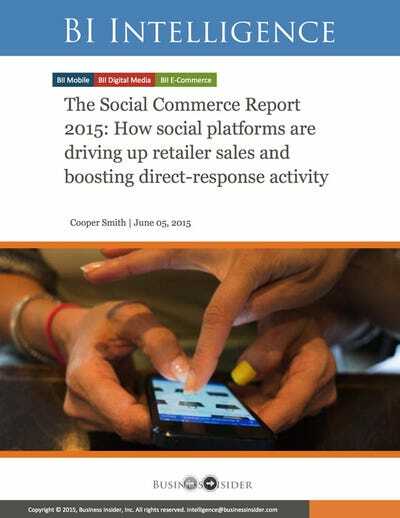 In this report from BI Intelligence we analyze social media’s role in online retail — whether that’s driving direct sales with the use of embedded “Buy” buttons on social media posts, or referring traffic to retailers’ websites and apps. We measure the impact social media has on e-commerce by looking at metrics such as conversion rates, average order value, and revenue generated by shares, likes, and tweets. 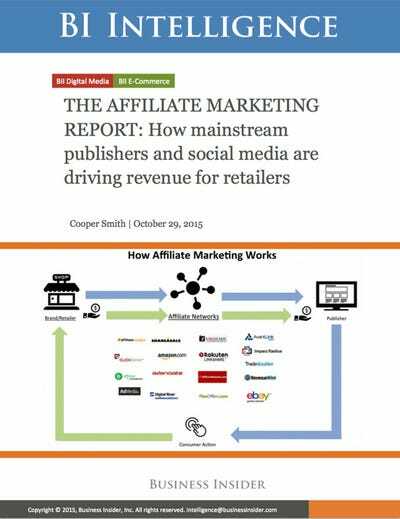 We also outline the latest commerce efforts by leading social networks.